The Ancient Egyptian goddess Taweret, ‘the Great One’, is depicted by scholars and in ancient Egypt as being the protective goddess of mother and child during pregnancy and childbirth. As with many ancient Egyptian deities, she goes by many names throughout. A few of her names have been Ipet, Opet, Reret, Ta-urt, Teweret and Thoueris. She is a composite figure of hippopotamus, crocodile, lion and human and uses her fearsome nature as an apotropaic device against demons who seek to destroy mother and child in their times of weakness. Most scholars suggest that Taweret is pregnant which adds to her symbolism in being the defender of pregnancy; however I find that the figures of Taweret are not pregnant yet are depicted with a swollen abdomen to represent the female form which is able to be pregnant, that is, to be fertile. The features of the swollen abdomen and the pendant shaped breasts are not unique to Taweret, yet are a shared attribute to the god of the Nile, Hapi, and fecundity figures found in temples. I propose that in depicting Taweret with similar attributes to figures of fertility of Egypt her purpose as a goddess is more complicated then a domestic goddess who protects family life. When Taweret is depicted with a swollen abdomen and pendant breasts I believe she is representing a pre-dynastic mother goddess, similar to Hathor Mehet- Weret, and due to her similar depiction to Hapi and the fecundity figures her purpose is not only to protect pregnancy and childbirth but to guard and represent the fertility of Egypt. The figure of Taweret I will be focusing on is the amulet in the Metropolitan Museum of Art’s collection. The Metropolitan Museum of Art’s collection dates the piece between the twenty-sixth and twenty-ninth dynasty, which is part of the Late Period. They have defined that the amulet is made of faience. The amulet of Taweret is a composite figure, as mentioned before, which is a mixture between human, crocodile, hippopotamus and lion. The torso and head have hippopotamus attributes, the arms and legs are typical of a lion, the headdress that falls down the back of the amulet is a crocodile form as with the tail, and the breasts are human as with the posture. The combinations of these three brutal animals of ancient Egyptian life depict the strength and ferocity of the goddess. The same animals create the form of the most terrifying ancient Egyptian monster, Ammut. Even though the composite animals are identical, Ammut is missing the human attribute which could be the signifying characteristic that made Taweret a goddess and not a monster. The figure has the left leg forward which follows the tradition of sculpture in the ancient Egyptian canon. The figure is either wearing a headdress or a wig in the front which is characteristic of female headdress wear. The arms fall down on the stomach of the goddess, which prevents the statue from having any weak points as the Egyptians avoided in the majority of their sculpture. The structure of the piece seems traditional in formal analysis yet because of its purpose as an amulet the statue is deeper in its meaning. Amulets served a purpose for the living and the dead. In the case of an amulet of Taweret for a living owner the statue would have been used to protect themselves from demons that harm pregnant mothers and newborn children. In addition, the amulet would help the women along in childbirth and guard them from creatures that were extremely dangerous such as crocodiles and hippopotamuses (Cartwright 195). They would keep the amulets in their homes which would create their living surroundings into domestic shrines. The popular household deities that represent fertility are Bes, Hathor and Taweret, and their placement in homes were prominent due to the danger pregnancy and childbirth had on women in ancient Egypt (Robins 87-90). The dead used the amulet in the tomb for the purpose of gaining one preferential notice with a particular deity and protection in the afterlife. “These objects were endowed with magic powers and that where magic is concerned mystery and obscurity of meaning only add to the occult efficacy desired” (D.D. 122). The magic behind the Taweret amulet is clear. The amulet is an apotropaic item that is valued to protect the living and the dead because the ancient Egyptians believed that when one was newly dead they were in an equally weak state as when they were born (Robins 2008). Therefore, the presence of Taweret’s amulet in burial as stated previously by scholars is valid because the rebirth into the next life needs protection which is an attribute of Taweret; which is why she is seen sometimes with the ‘sa’ hieroglyph. However, these facts do not explain the reason why her shape differs dramatically from the other fertility goddesses. The other anthropomorphic fertility goddesses usually have the head of an animal/creature and the body of a traditional female in the Egyptian canon. Their breasts do not hang in pendant shapes as Taweret’s and their abdomens are not swollen. This is why scholars suggest that Taweret is the only pregnant goddess. Yet that does not explain the change in the style the breasts are depicted in. It is known that in ancient Egyptian art it was a rarity for the style to change because of the fear to disturb the balance of Ma’at. That is why I believe the style Taweret is depicted in is following another style; one completely separate from how the goddesses are shown. 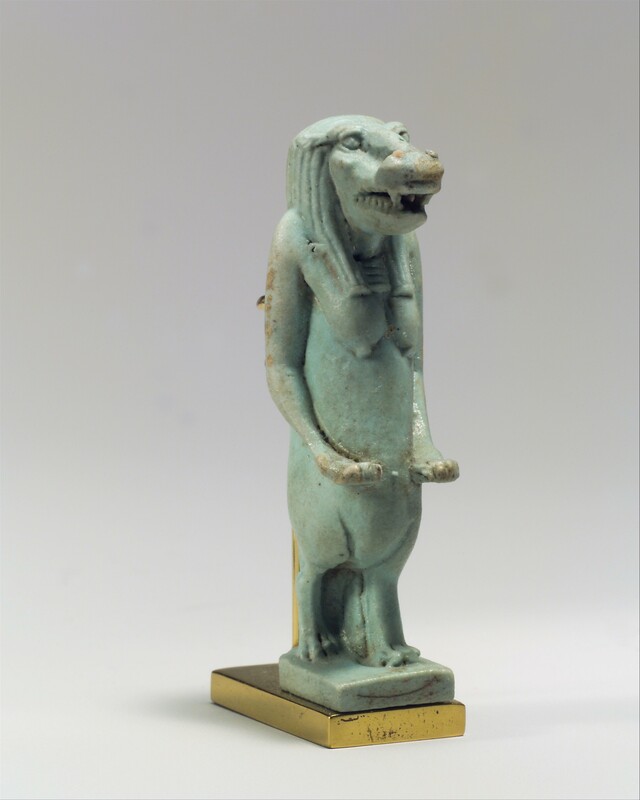 Taweret is a part of the fertility tradition in ancient Egyptian art because her image is clearly similar to the figures that represent the fecundity of Egypt. Hapi is the deity of the inundation of the Nile and he represents nourishment and fertility (Budge). Hapi is a male god in ancient Egyptian culture yet he is depicted with pendant shaped breasts and a swollen abdomen which is closely related to Taweret. Hapi cannot become pregnant because he is a male yet his abdomen is swollen to depict fertility; the image of one being able to be pregnant. The breasts offer the same interpretation. His image parallels the fecundity figures as well. Both sets of images show the fertility of Egypt which is reflected in the fertility of their bodies. The breasts and the swollen belly are symbols of the fertile nature of Egypt, not that they are pregnant or have breasts. Then how can scholars assume that Taweret is the pregnant goddess? It seems their rationale is based upon Taweret being a female deity and a goddess of pregnancy therefore she must be pregnant herself. If one follows the belief that an image with a swollen belly is pregnant then one can say that Akhenaten and Hapi must have been pregnant figures. I believe the characteristic of the paunchy stomach and the pendant shaped breasts create a new collective of figures which represent the fertility of Egypt. Yet the question remains of what the significance is between Taweret and fertility of Egypt. The hippopotamus goddess could be thought of as giving birth to the creator Sun god. In the secret crypts of the Temple of Ipet at Karnak, the hippopotamus goddess was said to give birth to the solar form of Osiris who rose again as Amun-Ra. In the Pyramid texts, the reborn king is nourished by the sweet milk of Ipy; Ipet (Pinch 142). This creation story consolidated by Pinch is a possibility of why Taweret, also known as Ipet, is seen as a mother figure rather than a domestic goddess. If Taweret was one of the goddesses from the primeval marshes then her importance with the fertility of Egypt would be paramount. She would be an obvious protector of pregnant women and children because she is the mother goddess and in a sense the mother of ancient Egypt. In working with the inundation of the Nile she guards Egypt from a depletion of fertility; she protects Egypt’s pregnancy and makes sure prosperity occurs. Her roles as goddess of pregnancy and mother goddess complete the overall function of being a fertility deity. Her importance is indicated when Pinch suggests that when major goddesses such as Hathor and Isis were identified as ‘saviors of the innocent’ they would change form to resemble a hippopotamus goddess. Even though Taweret’s form is grotesque in comparison to the traditional depiction of the goddesses it obviously represents an imperative function. To suggest that Taweret is a typical goddess would be an understatement that unravels the essence of the Egyptian artistic canon. She is not slender nor fits the traditional beautiful standard as the other Egyptian goddesses. She is the Ammut parallel who is a savior to women and children. Her swollen belly is not meant to be realistic as to suggest that she is pregnant but to relate her to Hapi and the fecundity figures as to show the viewers that she is more than a domestic deity. Budge, E.A. Wallace. The Gods of the Egyptians. Chicago: Open Court Publishing Company, 1969. Cartwright, Harry W. “The Iconography of Certain Egyptian Divinities as Illustrated by the Collection in Haskell Oriental Museum” The American Journal of Semitic Languages and Literatures. 45.3: 179-196. D.D. “Amulets of the Late Period: Note on Some Recent Ascensions to the Egyptian Department”. Bulletin of the Museum of Fine Arts. 28.170: 117-123. Pinch, Geraldine. A Guide to the Gods, Goddesses, and Traditions of Ancient Egypt. New York: Oxford University Press, 2004. Robins, Gay. Women in Ancient Egypt. Cambridge: Harvard University Press, 1993. ---. The Art of Ancient Egypt. Cambridge, Harvard University Press, 2008. Candace A. Reilly graduated in 2012 with a concentration in Art History from Drew University in Madison, NJ.